The Marshall AR-AM4-BG is a 4-channel audio monitor with front-panel peak meters housed in a rackmount with a footprint of just 1RU. The unit comes equipped with 4 XLR stereo inputs and 1 output. The DSP controlled equalizer combined with a sophisticated limiting compressor produces crystal clear sound, making it ideal for virtually any speaker system. Whether it's in a studio or high-end editing workstation, the AR-AM4-BG is a great addition to any professional video setup. The AR-AM series is the newest addition to Marshall's existing line of Audio Monitors. This new series establishes a benchmark for high-quality, low cost, rack-mount, near-field audio monitoring. They feature high fidelity speakers and DSP audio processing, with a variety of configurations. 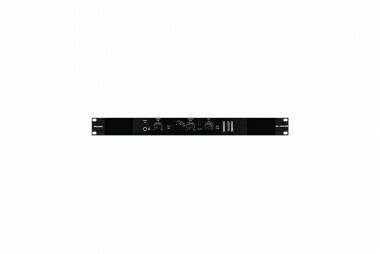 These new analog audio racks are ideal for TV facilities, studios, post production, VTR bays, mobile production vehicles, satellite links, and wherever audio monitoring is required. -Equipped with high fidelity miniature speakers and bi-color phase indicator. -A front panel USB port allows digital speaker delay control. -Rear panel RS-485 for external control. -Four analog stereo-balanced XLR inputs. -One passive stereo-balanced XLR output. -Dual tri-color bar graph peak meters. -Headphones automatically mute internal speakers. -CE approved and RoHS compliant.